Sterling Silver Chain Bracelet, "Life Source"
Intricate sterling links envelop the wearer with the mystique of life's origins. By Henry Anthony Sanny, this stunning bracelet is crafted by hand. The Indonesian designer takes his inspiration from bean sprouts. 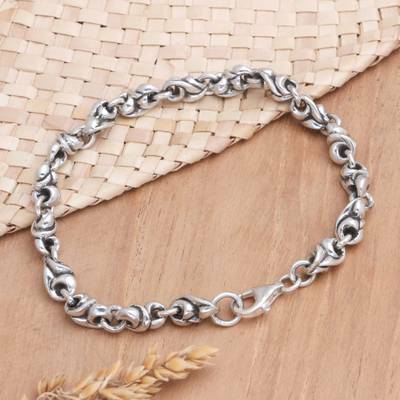 You can find sterling silver chain bracelet 'Life Source' by Henry Anthony Sanny in jewelry categories such as No Stone Bracelets, Silver Bracelets, Sterling Silver Bracelets and Chain Bracelets. Enjoy exploring these sections for other Novica treasures.